For most people, winter means colder temperatures and extreme weather that impacts vehicles differently than any other season. Just as there is different clothing for protection from winter weather, vehicles need different protection and TLC during the winter too. To help with winter weather, here are some great ideas for promoting products and services for winter car care. Prepping a bumper cover and other surfaces is critical to ensuring proper paint adhesion. Correct surface prep can minimize or eliminate costly, time-consuming rework. 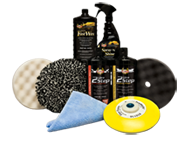 When it comes to detailing, there are a million opinions and tons of information available online. A lot of the information is good, but some of it is simply misleading (or just plain wrong)! The following are three common misconceptions that we at Presta would like to clear up. It’s now time to put away the convertibles, and store RVs and boats for the winter. These big investments can’t just be put to storage and forgotten until April. There are important actions that need to be taken to ensure they are cleaned and protected. Follow our winter storage prep tips so they’re ready to use when the weather turns warm again!